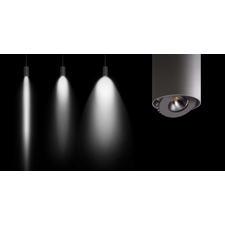 Montreal, QC, January 8, 2019 – Luminis (www.luminis.com), an established innovator and manufacturer of specification grade lighting solutions, has announced that it has developed a new optics module for its Syrios family. The module, which will offer more optical flexibility, increased performance and improved efficiency will be included as standard in all Syrios models. Syrios has already been recognized as the leading product in its category, winning industry innovation awards. In terms of optical flexibility, all luminaires now benefit from a 9° narrow beam with a sharp cut-off option. There is also a narrow reflector, varying between 12° and 15° depending upon the model, for high ceiling applications. All products will now have a 26°-30° flood optic as standard and a 40°-55° wide optic option, depending on the model. The advanced optics will also impact performance, increasing the lumens delivered across all products. For example, the Syrios SY800 now delivers a maximum of 7,500 lumens against 5,600 lumens previously. And, the Syrios SY802 now has a maximum delivered lumens of 13,000 – up from 9,500 with the older optics module. The Syrios and Syrios Square families consist of high performance, contemporary wall, pendant and surface mount luminaires. Other products in the Luminis portfolio will also benefit from the new module, including Oculus, a recessed, adjustable downlight and Scopo, a family of ground, pole or surface mounted adjustable projectors. Visit www.luminis.com to discover more about these products. Luminis designs and manufactures specification grade interior and exterior lighting for a wide range of applications including parks, campuses, urban and commercial developments, offices, retail stores and schools. Throughout its 30-year history, the company has invested heavily in research and development to produce innovative products that integrate style and technology to deliver high efficiency, performance and durability. The company’s products have been recognized with a catalog of innovation awards, including PIAs, ADEX and IIDEX, as well as being included in the IES Progress Report selection. Luminis is a registered trademark of The Luminaires Group. More information about Luminis is available at www.luminis.com.